In less than a week, New Fantasyland will have it's Grand Opening in the Magic Kingdom at Walt Disney World in Florida. At the end of October, I was invited to visit Disney World and preview the attractions in New Fantasyland. I jumped at the chance to see what the new section of the park was going to look like. The New Fantasyland project is the biggest expansion the Magic Kingdom has seen in its forty years. (Seems like 40 is the age to look at getting a little work done!) The project doubled the size of Fantasyland and in my opinion, completed it. I couldn't see it before, but now, having seen the new area, the old Fantasyland seems not quite done. We were fortunate enough to have two Imagineers with us when we toured. 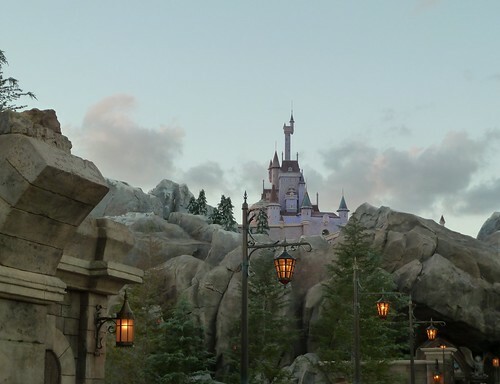 (Walt Disney Imagineering focuses on concept, design, and the ever important story) Chris Kelly and Diego Parras shared some of the process behind developing the story for New Fantasyland. One of the many things that separates Disney Parks from other theme parks is the story that weaves throughout the parks. Everything has a story. It was a gift to walk through the expansion and be able to see it through their eyes. But let's get down to it. Let's answer the questions I know you're asking. What did I think? What about the attractions? What about the food? There must be shopping! Where are the characters? What does it all meannnnnn? Ahem, before I get too carried away, let's get to it. I will do a more in depth post about all of these but I'll hit the highlights today. Attractions New Fantasyland opens with several new and reimagined attractions in two distinct areas. In the Enchanted Forest, you will find Enchanted Tales with Belle and Under the Sea~Journey of the Little Mermaid. The aptly named Enchanted Tales with Belle was a delight. It's hard to give too much detail because there is an audience participation component that puts everyone into the story. The experience takes character interaction to an exciting new level. 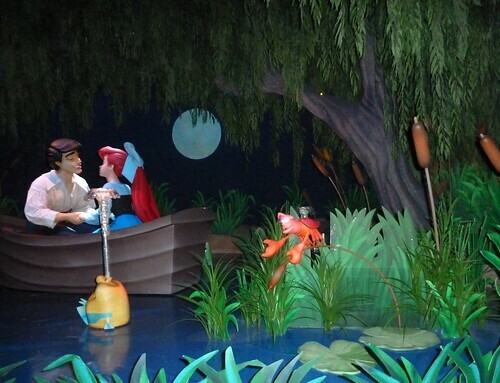 Under the Sea~Journey of the Little Mermaid is a beautiful, classic Disney dark ride. You ride in a clamshell (similar to the Finding Nemo attraction in Epcot) to the bottom of the sea and experience highlights of The Little Mermaid's story. In Storybook Circus, The Barnstormer rollercoaster now stars the Great Goofini, Dumbo the Flying Elephant has doubled its capacity with a second ride and an amazing indoor waiting area, and you will find the new Casey Jr. Splash & Soak Station. 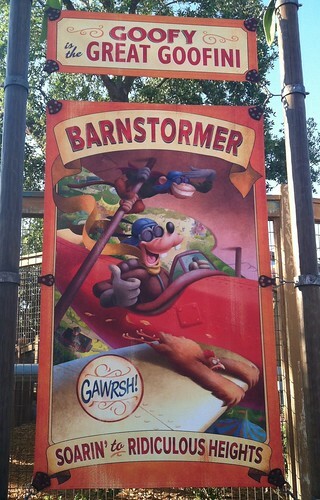 The Barnstormer is a great introductory rollercoaster. It was the first my daughter would ride and she still insists on riding it at least once a visit. (We all enjoy it, too!) The changes to the Dumbo attraction are brilliant and so very welcome. Doubling the capacity AND giving families an interactive, inside waiting area? Genius. We all know how hot Florida can be. The Casey Jr. area is a great place to cool off. Food In the Enchanted Forest you will find Gaston's Tavern, Be Our Guest Restaurant, and Maurice's Amazing Popping Machine. Gaston's Tavern is a counter service restaurant with inside seating. 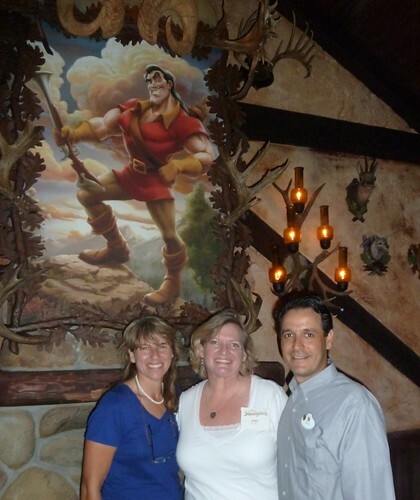 Gaston's is exactly what you would expect from the movie (he does use antlers in all of his decorating!) It has a menu that includes a new pork shank, delicious cinnamon roll, and the new beverage, Lafou's Brew. Be Our Guest is a clever new addition. For lunch the restaurant is a quick service location and it changes to table service for the evenings. There is so much to share about Be Our Guest, it will truly require it's own post. The restaurant is insanely beautiful and every detail is so well thought out. (The food was incredible, too!) Maurice's Amazing Popping Machine is a stand in the village to get that wonderful Disney popcorn. Sharp eyes might see the plans for the popping machine when they walk through Maurice's cottage! In Storybook Circus you can find Big Top Treats inside the new Big Top Souvenirs which brings us to..
Shopping Big Top Souvenirs is a circus themed shop. You can find an assortment of merchandise, especially of the flying elephant variety! Bonjour Village Gifts has opened in the Enchanted Forest. This shop is carrying Beauty and the Beast themed gifts. There are some lovely gifts including specialty china and glassware. Characters Ariel has taken up residence in her new grotto. Fans young and old will appreciate the queue with great seaside details. Although it isn't a traditional character experience, you will meet Belle at her Enchanted Tales. Gaston has been making appearances by his tavern. The Beast has been seen near Be Our Guest. In Storybook Circus, Pete's Silly Sideshow has opened with appearances by Minnie Mouse, Donald and Daisy Duck, and Goofy. What does it all mean? There is a whole new area to explore and love! I'll be writing more, but I wanted to include this link to a video from the Disney Parks Blog. We were able to help make Magic Kingdom history!!! I attended this New Fantasyland preview at the invitation of Disney Parks. My travel, hotel, park tickets and some meals and experiences were provided. I was not required to post but cannot help blogging about one of my very favorite subjects. My opinions, as always, are my very own.